On 4 September 2010, a magnitude Mw 7.1 earthquake struck the Canterbury region on the South Island of New Zealand. 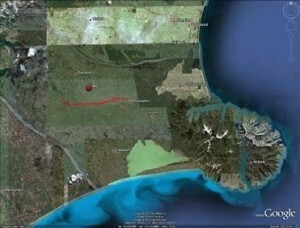 The epicentre of the earthquake was located in the Darfield area about 40 km west of the city of Christchurch. Extensive damage was inflicted to lifelines and residential houses due to widespread liquefaction and lateral spreading in areas close to major streams, rivers and wetlands throughout the city of Christchurch and the town of Kaiapoi. Unreinforced masonry buildings also suffered extensive damage throughout the region. Despite the severe damage to infrastructure and residential houses, fortunately, no deaths occurred and only two serious injuries were reported in this earthquake. From an engineering viewpoint, one may argue that the most significant aspects of the 2010 Darfield Earthquake were geotechnical in nature, with liquefaction and lateral spreading being the principal culprits for the inflicted damage. Following the earthquake, an intensive geotechnical reconnaissance was conducted to capture evidence and perishable data from this event. The team included the following members: Misko Cubrinovski (University of Canterbury, NZ, Team Leader), Russell Green (Virginia Tech, USA, GEER Team Leader), Mitsu Okamura (Ehime University, Japan, JGS Team Leader), John Allen (TRI Environmental, Inc, TX, USA), Scott Ashford (Oregon State University, USA), Elisabeth Bowman (University of Canterbury, NZ), Brendon Bradley (University of Canterbury, NZ), Brady Cox (University of Arkansas, USA), Tara Hutchinson (University of California, San Diego, USA), Edward Kavazanjian (Arizona State University, USA), Takashi Kiyota (IIS, University of Tokyo, Japan), Rolando Orense (University of Auckland, NZ), Michael Pender (University of Auckland, NZ), Hirofumi Toyota (Nagaoka University of Technology, Japan) and Liam Wotherspoon (University of Auckland, NZ). This article summarizes some observations and preliminary findings from this early reconnaissance work. The earthquake occurred at 4.35 am local time, on 4 September 2010. It was caused by a rupture of a previously unrecognized strike-slip fault, now well-known as the Greendale fault. The earthquake resulted in a surface rupture approximately 29 km long in the east-west direction (Figure 1). The length of the fault rupture at depth is estimated to be on the order of about 40 km. 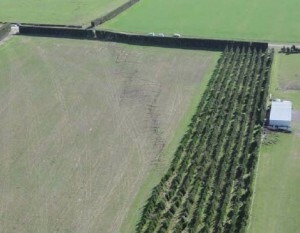 Aerial photos of the surface rupture expression taken from a helicopter flyover on 10 September is shown in Figure 2. It is interesting to note that the faulting resulted in a narrow rupture zone at the surface despite hundreds of metres of thick gravel deposits at the ground surface.